This spacious 1 bedroom apartment is located in a post-war elevator building in Kips Bay- just steps away from Baruch College, renowned dining, coffee shops, bars, shopping and entertainment venues. The apartment has high ceilings and faces the back of the building, which creates a very peaceful and quiet interior. 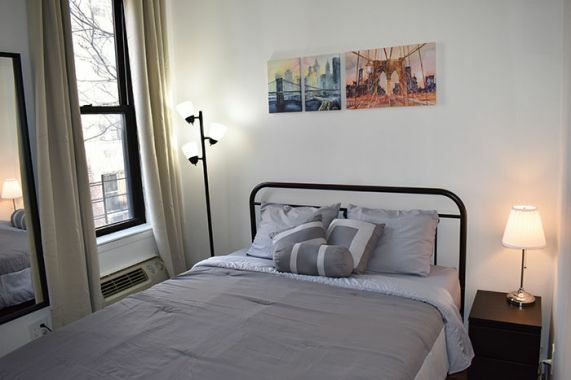 Close to both Gramercy and Murray Hill neighborhoods, this apartment features a gorgeous view of the Empire State Building as seen from the bedroom window! This East Side flat features a large open floor plan, and plenty of windows to allow for fresh air to circulate. The bedroom has a queen size bed with fresh linens, a generous closet, and a storage chest for clothing. The spacious living room has a sofa bed for additional sleeping options and a big closet which provides ample storage space. Fully equipped kitchen comes stocked with dishes, cups, pots/pans, and cooking utensils. There's a breakfast bar with stools as well as a 2-person dining table where you can enjoy your meals. Clean towels are provided for bathroom with full size tub. Laundry facilities are conveniently located in the basement of the attached building.